5'10" x 28" x 28"
Gallery Hours: Tuesday-Saturday, 11 a.m. - 6 p.m.
January 22, 2016, 6-9 p.m. The San Francisco Arts Commission (SFAC) Galleries celebrates the opening of a new, and greatly expanded 3000-square-foot gallery space in the historic War Memorial Veterans Building with three distinct exhibition projects featuring works by thirteen regional artists. 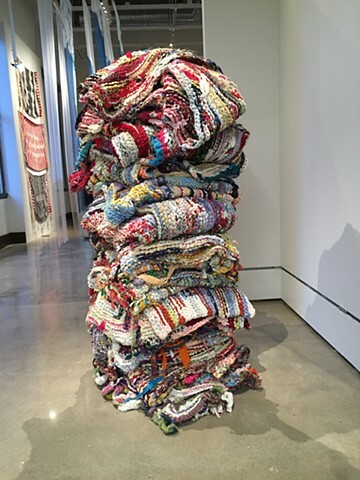 Taking up the largest volume of the gallery is the exhibition Bring it Home: (Re)Locating Cultural Legacy through the Body, curated by SFAC Galleries Director Meg Shiffler and independent curator Kevin B. Chen. The exhibition presents work from artists representing diverse Bay Area communities, and centers thematically on how these artists grapple with cultural identity and its relationship to the human condition. Bring it Home features work by both established and emerging Bay Area artists including Zeina Barakeh, Jeremiah Barber, Vic De La Rosa, Guillermo Gómez-Peña, Dana Harel, Carolyn Janssen, Summer Mei Ling Lee, Ranu Mukherjee, Ramekon OArwisters, and Tsherin Sherpa. Working in media ranging from painting to digital photography, video to textiles, performance to sculpture, the artists attempt to reconcile and bridge differencessuch as past and present, historical and contemporary, Eastern and Western, traditional customs and modern conventions, religious and secularand the ongoing search for grounding and a sense of home, these artists make culture and history highly personal by presenting the body (and often their own body) as a site of inscription and fractured performances.